Premier online art galleries for artists and art lovers, featuring member artist pages and artworks for sale. 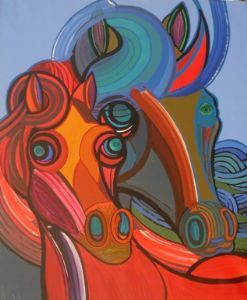 Description: Year: 2013 Comment: Horses are a recurring theme in the artist's work. He complies with a request made by his father, to paint this animal because they are painted noble, tender, faithful and educational history lived by the family with a horse. See the structure of the work where the chromatic range and its design give us a moment of communion. Academic Formation 1987: He graduates in the specialty of Painting in the Superior Institute of Art 1972: He graduates in the specialty of Painting in the National School of Art. 1966: He graduates of the specialty of painting in the Provincial School of Art of Santa Clara Leopoldo Romanach. Personal exhibitions 2004: His work Guitar, taken to Mosaic, is placed in a central street of the city as part of the Architectural Project "The Ramp" 2003: His work Guitar is selected in the Competition of Architecture Project "The Ramp" 2002: He exposes in the hotel England, the personal sample dedicated Jos?Mart? with this exhibition the artist celebrates the 185 anniversary of the foundation of the Academy San Alejandro 2001: He travels to Mexico to impart the master "Methodology for the teaching of the arts", where he presents his exhibition personal "Song to the Life". 1999: His work is promoted by "Decoro" and he paints in the hotel "White Arenas" of Varadero the Restaurant Buffet, considered by him, one of the most beautiful works in his artistic trajectory. 1997: Personal exhibition SOSZOO, in the gallery The Acacia, where the artist celebrates his 25 years in the artistic teaching. 1995: His work is promoted by the Center of ambient Design, he paints for important tourist centers. 1994: His is invited by the Center of Fine arts of Maracaibo, Venezuela, to present the personal exhibition "Noble and Loyal", in homage to the 465 anniversary of the Foundation of Maracaibo. 1993: He travels to Venezuela invited by the Festival of the Arts, the group of theater "Tabl? ", and the school "In? Laredo", where he presents a personal exhibition in Homage to Angela Hill, the woman that makes dolls in Cabimas. 1992: He travels to Venezuela invited by the IV Festival of the Arts and he exposes a personal sample in the Municipal Museum of Graphic Arts Balmiro Le? Fern?dez 1989: He paints in the Institute of Oncology, children's Room, the mural "They deserve everything". According to the artist, it has been one of the most beautiful and human responsibilities that has carried out. 1988: He participates in the VI Biennial Ibero-American "The children in today's" Ibero-American Painting, Mexico City, with the work "The world of the children" 1987: Exhibition personal "Dream and Reality" He travels to Poland, where he presents a personal exhibition in the "BIURO WYSTAW ARTYSTYCZNYCH WSOPOCIE". 1986: Personal exhibition "to Paint Forever", in the Gallery Havana. Collective exhibitions 1999: He travels to Belgium invited by the museum Lanchelevinci presenting the exhibition collective "Flags and colors". 1998: Collective exhibition of painting in Portugal organized by the National Union of Writers and Artists from Cuba. Exhibition collective "Plaza for the Cuban art" in the Hotel Plaza organized by the National Union of Writers and Artists from Cuba. 1997: Collective exhibition of Cuban painting organized by the gallery "The Acacia" of Cuba that was presented in the gallery "Golden Branch" of Panama. 1989: Exhibition collective Cuban Painting in Bulgaria, organized by the National Union of Writers and Artists from Cuba 1988: Exhibition collective Cuban Painting in Warsaw, Poland 1985: Exhibition collective itinerant Youths of Today carried out in the Japanese cultural centers. AT Central Museum Tokyo (January) y AT Prefatural Museum of Miyagi (February).